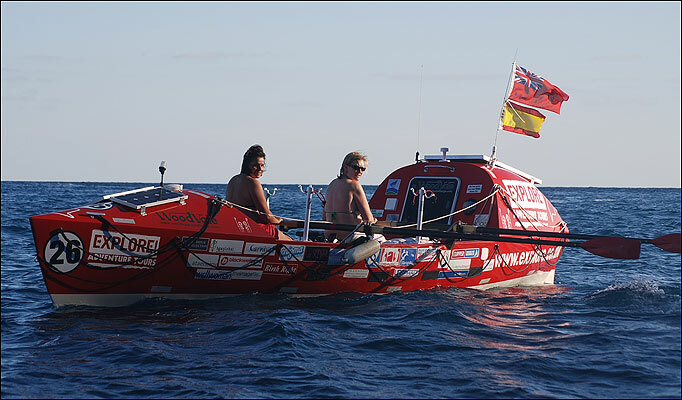 Two British women are attempting to make history as they set out on a 3,000 mile journey rowing across the Atlantic Ocean. Annie Januszewski (left), 40, and Mel King (right), 37, are looking to break the record for transatlantic travel by an all-female crew. The record right now is 75 days, but the pair are looking to do it 70. To aid them along in their journey, the women have a unique hook, they’re going to do the whole journey naked. Originally they were going to just do the trip in their bras and underwear (to prevent chafing from their clothes) but changed their minds and are going to do the whole trip sans clothes now. Among the challenges ahead for the women are 35 foot waves, days rowing for over 15 hours and of course, sunstroke and burns. But at least they won’t have to worry about tan lines! The team is leaving the Canary Islands today, as part of the Atlantic Rowing Race 2009 and hope to reach Antigua in February. If they make it, they’d be only the 7th all-female crew to make the crossing, and presumably the only ones to do the whole thing naked. The trip isn’t just for the two women though, when they reach Antigua they’ll have raised over $50,000 for the MacMillan Cancer Support charity. “I have always, always wanted to do something of this magnitude and what could possibly be bigger than rowing the Atlantic and setting a world record?” Annie said.